DowntownCedarCity | A vibrant place to shop, dine, stay & play! A vibrant place to shop, dine, stay & play! Tour of Utah returning to Cedar City! Along with the expansion to seven full days of racing this August, the Larry H. Miller Tour of Utah professional cycling event will broaden its geographical footprint to 12 host cities and venues across two western states. At a press conference today on the campus of University of Utah, organizers of the Tour of Utah announced three first-time venues for the 10th anniversary of the event, including an inaugural expansion beyond the borders of Utah. This year’s week-long sporting event will extend from the red rock spires of Cedar City in southern Utah to the peaks of the Uinta Mountains outside Evanston, Wyoming. The 2014 Larry H. Miller Tour of Utah will take place August 4-10, sanctioned by both USA Cycling and the UCI (Union Cycliste Internationale). Known as “America’s Toughest Stage RaceTM”, the Tour of Utah annually features more than 600 miles of racing and 38,000 feet of climbing. The Tour of Utah continues to be sanctioned by the UCI as one of the top professional cycling events in North America, a 2.1-rated UCI American Tour stage race. The Overall Start on Monday, August 4 returns to southern Utah. Cedar City, known as “Festival City, USA,” hosted the finish line for Stage One last year. This summer Cedar City, home to Southern Utah University and the Utah Shakespeare Festival, will host the start and finish for Stage One, as well as pre-race festivities on the weekend, such as the Team Presentation Event. New Center of the Arts to Become a Reality! 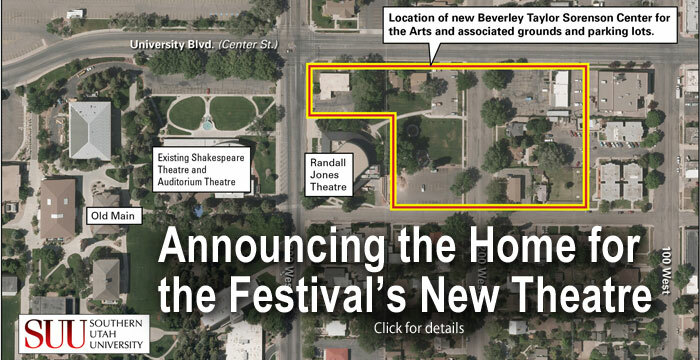 Southern Utah University announced that it has received a $6 million gift from the Sorenson Legacy Foundation to create a multi-million dollar arts center encompassing new facilities including the Southern Utah Museum of Art and the Utah Shakespeare Festival Outdoor Theater. Construction is slated to begin in Spring of 2014. This is BIG news for Downtown Cedar City as the new center will certainly bring more people into the district. The Downtown Retail Alliance is very excited that this project will become a reality. Tour of Utah coming to Cedar City! The exciting announcement that the Larry H. Miller Tour of Utah will start their first stage of this international cycling race in Cedar City is big news, economically speaking. Race will be in Cedar City August 5 & 6th. Watch this video to see what the big deal is all about! Please Join Us for a Big Announcement Feb. 5th! Cedar City Events and Larry H Miler Tour of Utah will make an announcement about a major event that will have a HUGE impact on Downtown Cedar City on Tuesday, February 5th at 11 a.m. at the Cedar City Regional Airport. You’ll want to be there. We hope you have taken the time to come downtown and see all the new lights and decorations recently put up by the city. Funds from the Redevelopment Agency (a funding source from the Lin’s Marketplace lease to provide economic development of the downtown area) went into the new lights. The lights are stunning and are doing the job they intended, which is to bring people into the downtown to hopefully shop, eat and recreate. Why is that important you might ask? Well, a viable downtown represents an overall viable city. When you travel, what city sites resonate with you positively? Most likely an exciting downtown comes to mind (think Park City and Salt Lake City) . Now think of communities that have a blighted downtown-how does that affect your overall experience? Do you stop and shop for a souvenir? City sales tax revenues support city infrastructure (streets, water, sidewalks) and quality of life (parks, trails, events). An attractive, vibrant community and downtown brings in outside dollars in the form of tourism that adds to those revenues, keeping your taxes low while enjoying a well served community. More importantly, it’s the idea of supporting local business, which in turn helps everyone. So tis the season to get out and shop. We hope that you’ll pledge to shop local this year and come down to downtown to find that unique gift and to enjoy the magical holiday lights. Friday Night @ 6 p.m. at the Heritage Center! Mayor Burgess and his wife Beverly would like to invite you to attend the Christmas Lighting Ceremony Friday night (Nov. 23rd) at 6 p.m. at the Heritage Center Outdoor Stage. The Mayor will “flip the switch” on the new Christmas lights and decorations recently installed downtown. There will be musical numbers and Christmas carols. We are encouraging businesses to take advantage of this event by staying open late, offering hot chocolate, and/or giving out coupons or special discounts. The tree lights will stay on all year to help create a downtown attraction. It’s beginning to feel a lot like Christmas! The Cedar City Redevelopment Agency recently appropriated $70,000 for new Christmas lights and decorations for the downtown. The best part will be the lights for the trees that line Main Street and Center Street. They will be strung with white lights that will remain lit throughout the year. These lit trees will bring another attraction to the downtown by providing a pedestrian friendly atmosphere. We salute the RDA for making this investment in Downtown Cedar City! Cedar City’s Downtown Retail Alliance formed in February of 2010 with a mission to represent the interests of downtown business owners to develop and preserve the area as an inviting and vibrant center for commerce and activity. The Alliance has also been diligent in partnering with community and government sectors to cultivate a new vision for the downtown. In August 2010, the Downtown Alliance requested that the Cedar City Rural Development Agency contract with HyettPalma and the National League of Cities to conduct an update to a study done in 1996. The purpose of the update was to provide a strategic Action Agenda Plan to be implemented over the next five years. Upon completion of the study in January 2011, several members of the Alliance began serving on the Downtown Revitalization Board, appointed by Cedar City Corp to prioritize and implement the initiatives determined in by the Hyatt Palma study. Those initiatives included: a retail study, incentives for business owners to update their signage, tenant improvement grants to update buildings in the downtown, and grants for art benches and bike racks (utilizing the talents of local artisans). A Master Plan was also requested. Educational Seminars and One on One Consulting: provide business owners educational seminars and personalized consulting, including: merchandising, interior/exterior décor, customer service, marketing, best business practices, social media, historical preservation, etc. Advocacy: Alliance will continue to advocate stronger relationships with property owners to encourage their participation in the enhancement effort. Charitable Contributions: contribute small grants to downtown specific events. 1. Cedar City Downtown Farmers Market- Provide local farmers with a place to sell produce and provide consumers the opportunity to purchase fresh, local produce. 2. Groovefest-American Music and Cedar City Art Festival- a celebration of American roots music that takes place in the downtown Main Street Park featuring nationally touring musicians and local artisans. 3. Cedar Livestock & Heritage Festival- a celebration ofCedarCity’s livestock and agricultural heritage featuring a sheep parade downMain Street. Events: Alliance will continue partnerships with Southern Utah University and Cedar City Corp to hold events in the downtown to create vibrancy and nightlife, including a concert series, in store mixers and art and wine events. Downtown Promotions: The Downtown Alliance will work with business owners in promoting the historic district as the place to Shop, Dine, Play & Stay through promotional partnerships. Website-featuring downtown businesses & associate members, events calendar, things to do, historical information, heritage tour, videos, and business discounts. Social Media-implement a social media strategy utilizing FaceBook/Twitter/YouTube. Historical Preservation: Alliance will support initiatives to implement a historic preservation commission within the city to aid with identifying and protecting historic buildings and heritage sites and to help owners get into compliance with ADA/Seismic requirements through the City improvement incentive program. Streetscape Plan and Implementation: Alliance will continue to propose a streetscape initiative utilizing the City Redevelopment funds to beautify and unify the historical and cultural themes of the downtown. Downtown Clean –up: the Downtown Alliance will continue the tradition of holding an annual downtown clean-up each Spring to help beautify and maintain the cultural and historical elements of the district. The Downtown Retail Alliance is a non-profit 501(c)4 organization. The Cedar City Downtown Retail Alliance is happy to be online!